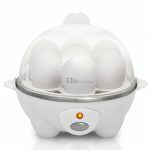 Henrietta Hen Egg Cooker Review: With the ability to cook eggs in several ways hard or soft boil up to seven eggs at once, or poach four eggs, the Henrietta Hen Egg Cooker will make a brilliant addition to your kitchen worktop. This egg cooker comes with an audible alert so you will always know when the cooking cycle has ended. 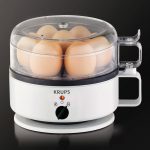 Users really like the fact that this unit produces perfectly cooked hard boiled eggs every time that are easy to peel. 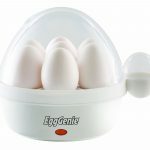 The Henrietta Hen Egg Cooker will cook up to seven eggs if you decide you want hard or soft boiled and up to four eggs if you want poached or scrambled eggs. If you hate that green ring you can get when you cook eggs then you will love the fact that this will not happen with the Henrietta. Most parts are dishwasher safe for added convenience. The base of the cooker has various water lines that will determine the type of egg you will want to cook from soft to poached. Once the appliance is switched on an indicator light will switch on. As the water boils and steams the eggs to whatever preference you have. And like a hen the Henrietta “chirps” when eggs are cooked. Start by placing the eggs into this egg boiler and then only wait a couple of minutes. It’s very easy, just add water and plug the chicken in to any wall outlet. After a couple of minutes, the Henrietta makes delicious eggs for everyone. The cooker makes chirping sounds that may sound more like a whistle to alert that the eggs are cooked. “I absolutely love her. She is the best egg cooker in the house. Please do not let the few negative reviews deter you from buying her. I hate to make poached eggs but with henrietta its a whiz. “I have had this product for about 7-8 years. I have found that if you add water to the correct level it doesn’t leak. “I just love Henrietta. I have used this product for about 10 years and then my 1st Henrietta started to leak a little. I didn’t care and kept on cooking the eggs. But when Henrietta’s whistle went silent, I know it was time to part ways. 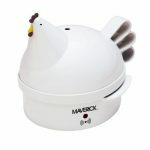 The Henrietta egg cooker has been reviewed by 338 customers on Amazon with an impressive rating of 3.9 stars out of 5.0. See the latest user rating on Amazon. 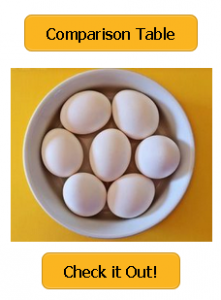 Boil/Poach Eggs – The hen-shaped appliance boils or poaches eggs to order. Cooking racks/trays – The poaching tray holds 4 eggs; cooking rack holds 7 eggs. 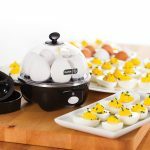 Power base – Power base with 1 of 3 water levels for soft-, medium-, or hard-boiled eggs. Piercing pin – Piercing pin prevents shells from cracking; dishwasher-safe removable parts. Dimensions – Measures approximately 7 by 7-1/2 by 8-1/2 inches. Lightweight – Weighs in at 2 pounds. The Maverick Egg Cooker is excellent cooking up to 7 eggs. The eggs are cooked fast and thorough. And when done the cooker emits a pleasant beeping sound that says the eggs are ready. Can leak if you don’t use the correct water level.